Items on the scorecard can change according to Durham's needs and self defined criteria, but this is a useful jumping off point to hold developments accountable to the community. Consider making your own equitable development scorecard with your community. 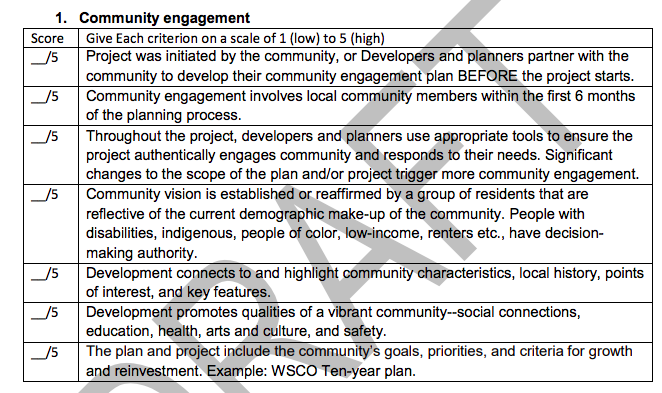 According to the Minneapolis WSCO criteria, the community engagement process for the Durham Belt Line Master Plan Draft is receiving a very low equity score of 1.57 / 5 and needs improvement. This can be fixed because the master plan is still in draft form and still in process, but will require a quick process change.